Shipping container entrepreneur Malcom McLean, standing at the railing at Port Newark, 1957. Photo courtesy of Maersk Line/Wikimedia Commons. McLean, born in the tiny cotton center of Maxton in 1913, was a compulsive entrepreneur, a man who was always thinking about business. As a child, he sold eggs from the side of the road. Graduating high school in 1931, in the midst of the Great Depression, he stocked shelves in a grocery store and then managed a gas station. He bought a used truck and opened McLean Trucking in 1934, serving as the sole driver while still selling gasoline. Armed with boundless ambition, he quickly built McLean Trucking into one of the nation’s largest trucking companies. McLean Trucking hauled textiles, cigarettes, and other goods up and down the East Coast. The Interstate Commerce Commission, a powerful federal agency, closely regulated trucking in that era, requiring that rates be based on the cost of providing service. Malcom McLean was known for innovative ideas that lowered his company’s costs, such as crenellating the sides of trailers to reduce wind resistance and improve fuel efficiency, so that regulators would allow his company to reduce rates and take market share from its competitors. By the early 1950s, U.S. auto sales were booming and highways were becoming heavily congested. The Interstate Highway system was still years in the future. McLean, concerned that traffic jams were delaying his drivers and raising his company’s costs, conceived of waterfront terminals at which trucks would drive up ramps and deposit their trailers aboard ships. He envisioned the vessels moving between North Carolina, New York, and Rhode Island, circumventing the heavy traffic and innumerable stop lights on highways that also served as main streets up and down the East Coast. Pres. 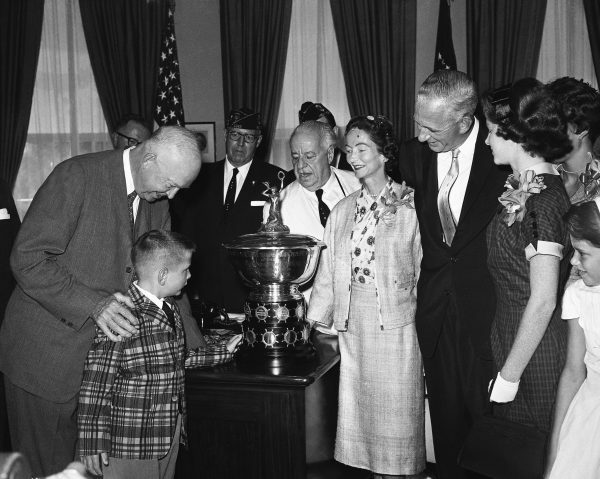 Dwight D. Eisenhower, left, leans over for a word with 7-year-old Malcom McLean, Jr., as the lad touches the 1959 American Legion Merchant Marine Achievement Award during its presentation at the White House, July 29, 1959. Young Malcom’s father accepted the award on behalf of the Pan American Steamship Corp., which he headed. In the group at right are, from left: Rep. Frank Boykin (D-Ala.), Mrs. McLean, Malcom McLean, Sr., and Nancy McLean, 13. Photo courtesy of Associated Press. The industry McLean proposed to enter was more than a little antiquated. A typical oceangoing ship in the 1950s carried around 200,000 separate crates, bags, barrels, and bales. They would arrive at the dock in hundreds of separate shipments. Each item had to be removed from a truck or rail car and moved into a warehouse. When it was time to load the vessel, the individual pieces of cargo were moved out of the warehouse, placed on the dock, and assembled onto pallets that were lifted by a winch into the ship’s hold. There, dockworkers removed each item from the pallet and stowed it. McLean pondered the problem and proposed detaching the trailer bodies from their chassis and wheels and putting only the bodies—that is, metal containers—aboard the ships. This would introduce some complications, such as the need for cranes to lift the containers off truck chassis, transfer them to departing ships, and then reverse the operation when a vessel arrived at its destination. On the other hand, containers, unlike truck trailers, could be stacked, allowing each ship to carry far more cargo. Since the vessel was easily the most expensive part of the operation, the more containers that could go aboard each vessel, the less it would cost to carry each one. The obstacles to McLean’s concept were daunting. Suitable containers, cranes, and ships did not exist; McLean hired engineers and naval architects and set them loose to solve the problems. Federal regulations barred trucking companies from owning ships, so in 1955 McLean sold his highly profitable truck line and then purchased a marginally profitable ship line he could use to test out his ideas. The potential demand for container shipping was unknown, but McLean bet everything on the venture he christened Sea-Land Service. Asked later whether he had considered ways to shelter his trucking wealth from the risks of an unproven business, McLean was unequivocal. “You’ve got to be totally committed,” he said. Many in the shipping industry regarded containerization as a concept with little potential … For his part, McLean thought the U.S. maritime industry was obsessed with its ships rather than its potential customers. Many in the shipping industry regarded containerization as a concept with little potential; McLean was, after all, an outsider unfamiliar with the industry’s storied traditions. For his part, McLean thought the U.S. maritime industry was obsessed with its ships rather than its potential customers. He aggressively built his business along the Atlantic and Gulf of Mexico coasts, on routes to Puerto Rico, and through the Panama Canal to California. He bought a ship line serving Alaska in early 1964, just before one of the most powerful earthquakes ever recorded created enormous demand to ship building materials by sea. In the late 1950s, other ship lines cautiously tried to follow. Their efforts ran headlong into union opposition. Discharging and reloading traditional ships could require armies of workers, and the dockworkers’ unions knew that a shift to container freight would eliminate thousands of jobs on the docks. Only after repeated strikes on both Atlantic and Pacific coasts did port employers and longshore unions reach agreements in the early 1960s about payments to dockworkers displaced by the new technology. The biggest barrier to the growth of container shipping, though, was diversity. Each company that followed Sea-Land ordered containers that suited its particular business, and each had a different design for the corner fittings by which cranes lifted containers. If a factory packed a shipment into one ship line’s boxes, the goods might have to wait for space on one of that carrier’s vessels and could only be delivered to a port which the line served. McLean, treated as an outsider by the leaders of the shipping industry, was not involved in these talks, but after a decade of fruitless bargaining, negotiators turned to him for a solution. He agreed to surrender Sea-Land’s patents so that every container in every country could use the same corner fittings. That, along with agreement on a standard 40-foot length, assured that any container could fit on any ship and be handled by a crane in every port. 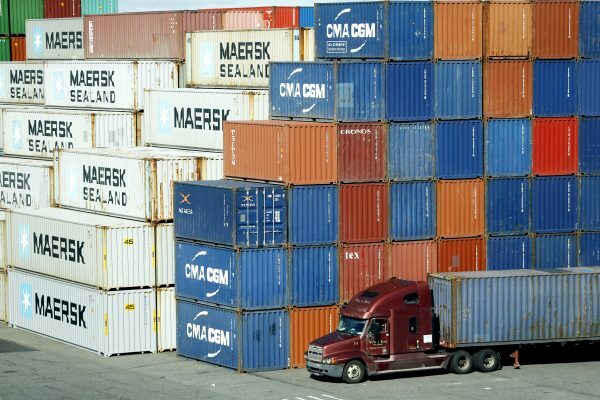 A truck parked near a stack of containers at the Port Newark Container Terminal in Newark, N.J., the nation’s second-busiest port, on Oct. 30 2015. Photo by Julio Cortez/Associated Press. Tobacco company R.J. Reynolds bought Sea-Land in 1969, but nine years later McLean reentered the shipping industry by acquiring United States Lines, a large but weak competitor. As always, competition was on his mind; he ordered a dozen containerships that were larger and more fuel-efficient than any afloat, expecting they would enable United States Lines to have lower costs per container than other carriers. This time, though, McLean’s intuitive management style worked against him. Oil prices plunged, leaving United States Lines with the wrong ships for the times. In 1986, the company filed for bankruptcy. Its ships were sold off, and thousands of workers lost their jobs. McLean was not ready to retire. Five years after the failure of U.S. Lines, at the age of 77, he founded yet another shipping company. Yet he remained out of public view, ashamed of his role in a failure that cost thousands of people their jobs. He shunned journalists and avoided public appearances. As a result, his legacy was not fully appreciated. By the time of his death in 2001, the industry McLean had founded with a single vessel carrying 58 containers had reshaped the global economy. The local industries that had been the norm in 1956 were long gone; thousands of ships were moving millions of containers around the world each day; the equivalent of nearly 10 million truck-size containers arrived at U.S. ports in 2016. Long-time port cities such as New York and San Francisco had been reborn after years of struggle to replace the jobs and industries lost to the rise of container shipping. Consumers had unprecedented choice among a nearly endless array of products from all parts of the world, but the manufacturing workers who produced those goods strained to cope with more intense global competition. McLean’s innovation, intended just to make his trucking company a bit more efficient, ended up changing the world in ways that no one had imagined.